Turn Amelies Cafe into the hippest hangout in town as you feed the famished masses! You'll have to stay on your toes as you take orders, tell your cooks what to make, deliver the food and keep the joint shining like a new penny. And you'll have to be smart when choosing which customers to serve next since some get crankier than others if you make them wait too long. A match-three mini-game. Three Endless Game modes. While all this is going on, you can play a match-three mini-game at the bottom of your screen to earn bonuses than can help you win. 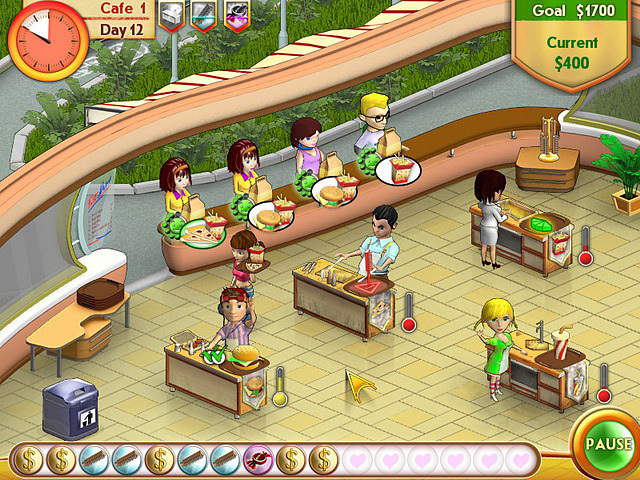 And between levels, you can slap on a new layer of decor or upgrade your cooks to make them work faster and cleaner. Hotter than a side of fries and sweeter than a strawberry shake, Amelies Cafe will satisfy your craving for fast-paced fun! World's biggest English learning software -- 40 Chapters, 6 CDs, Videos, Audio. Qweas is providing links to Amelie Cafe 2011 as a courtesy, and makes no representations regarding Amelie Cafe or any other applications or any information related thereto. Any questions, complaints or claims regarding this application Amelie Cafe 2011 must be directed to the appropriate software vendor. You may click the publisher link of Amelie Cafe on the top of this page to get more details about the vendor.